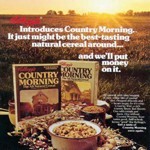 Country Morning was described on the box as "the all natural cereal". The boxes actually featured scenes of the sun coming up - reflecting off of country-style homes or small-town landscapes. 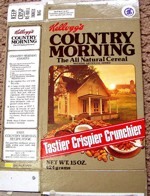 The back of some boxes showed a recipe and encouraged consumers to "treat your family to a delicious, freshly-bakes Country Morning Coffee Cake". 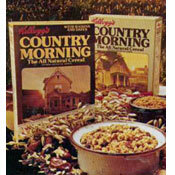 Kellogg's introduces County Morning. It just might be the best tasting natural cereal around... and we'll put money on it. All natural, with tasty nuggets of oats, crispy toasted rice, chopped almonds, and brown sugar. So it's crisp-crunchy. With a rich county flavor. Two flavors. One with raisins and dates. One without. Country Morning. Sure tastes good. And nobody knows "good" like Kellogg's. Get a taste of Country Morning once again. What do you think of Country Morning? The best cereal EVER! Does anyone know what the ingredients were so we could make it ourselves? 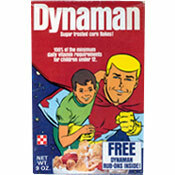 I wish Kellogg's would consider bringing back the best cereal ever - does anyone know if it is available in any other country? Now living in the USA, it is so funny to find that I'm not the only one that has been searching for this cereal or at least a similar alternative for all these years. Only one I found that's close is Wildflower Granola - the maple pecan flavor. I remember the care-taker of the camp I worked at in 1974 would buy Country Morning by the case - his own personal supply - and he willingly shared it with me. Sometimes we had it for a bedtime snack. Sure wish they'd bring it back. Love, love LOVED this cereal. I remember a windmill being on the box. Wish they would bring it back. Best granola cereal of all times. Kellogg's broke my heart when they discontinued it. It was baked a little darker than other granola and that changed the flavor in the same way that grilling a sandwich enhances its flavor. My favorite cereal. I'm bereft without it. No other cereal I've tried has been quite the same. I've been looking for it for years. Would really like it back. I remember a windmill on the box. H! I'm from England - Essex/Greater London. I never saw this and I can see how much we were missing!! The nearest that we get is Kellogg's Country Store. That BOX!! Looks so romantic! I've inquired about it 3 times with consumer support at Kellogg's and they keep passing it on to Kellogg's South Africa where it enters a black hole, much like everything else over here. Would love to have it back!